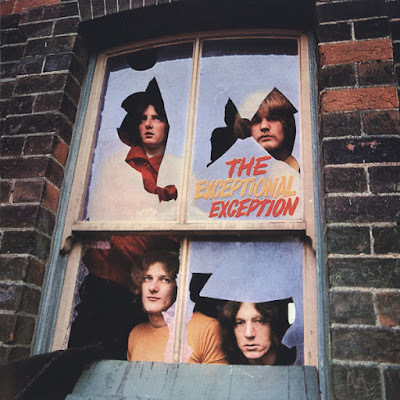 While The Exception were well-known locally, toured Europe, and recorded an album along with several innovative singles, they were unable to attain the level of success worthy of the collective talents within the band. 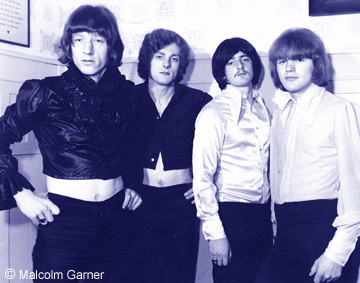 The core of the group consisted of drummer Alan "Bugsy" Eastwood and guitarist Roger Hill who were both former members of The Brumbeats. A blues-based line-up known as 'The Hooties' were formed in Birmingham during the summer of 1966 with guitarist Roger Hill, Alan "Bugsy" Eastwood on drums, and Tony Clarkson on bass guitar. Alan and Roger had previously played together in The Brumbeats with Roger later joining Steve Gibbons in The Uglys. Dave Pegg (also from The Uglys) was recruited to replace Tony Clarkson who left later that year and went on to join World Of Oz. The idea at the time was to create a trio along the same lines as Eric Clapton's 'Cream'. Rehearsals at Bugsy's house near Spaghetti Junction soon resulted in a very tight-sounding line-up. The Hooties played many of the well-known local venues including Old Hill Plaza, The Ritz (King's Heath), and The Belfry (Sutton Coldfield). They exploited their instrumental skills on-stage by sometimes swapping instruments in addition to Alan also playing harmonica or vibes as well as playing drums and singing lead vocals at the same time! In addition to performing blues standards and radio hits, Alan Eastwood began composing original material for the band. One of Dave Pegg's friends was future Led Zeppelin star Robert Plant who at the time was contracted to CBS Records. Robert recommended The Hooties to well-known music publisher Eddie Kassner which gained the band a recording contract with CBS. 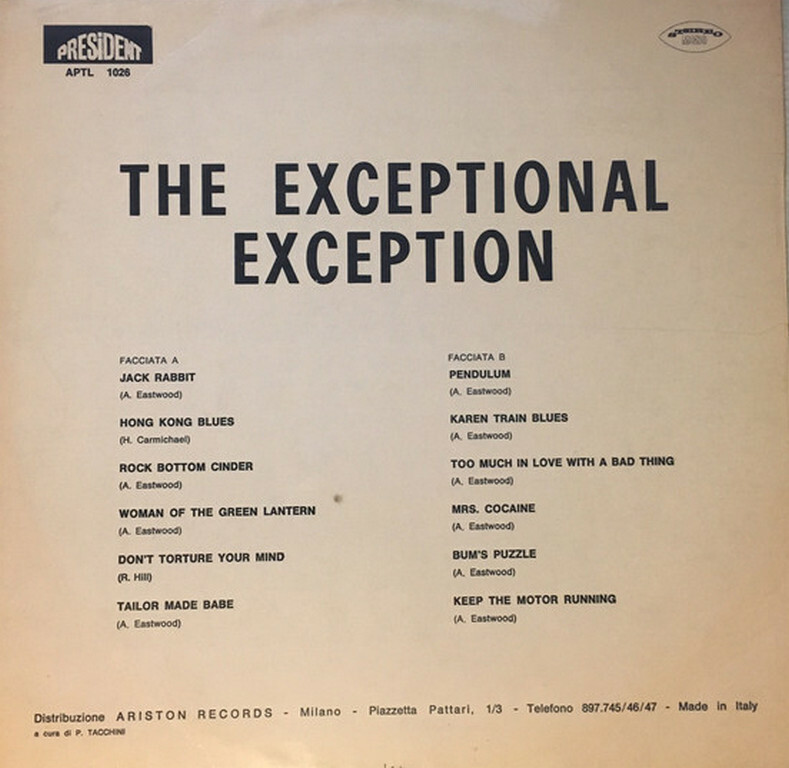 Re-naming themselves 'The Exceptions' their first single release was recorded at Regent Sound studios in London. Robert Plant actually played tambourine on the A-side titled 'The Eagle Flies On Friday' which was a powerful drums and vibes driven track. This, along with the B-side 'Girl Trouble' were both original compositions by Alan Eastwood. Dave Pegg recalled when interviewed by Laurie Hornsby for his excellent book 'Brum Rocked On!' that; "Bobby Hill (Roger's brother) had a brainwave to 'buy' the record into the charts so he toured the shops buying our record by the box full." Unfortunately, the New Music Express and Melody Maker had just been alerted about this type of activity so the retail figures for that week were ignored! The record did however attract interest in Germany where the band performed it live on the popular TV show 'Beat Club'. 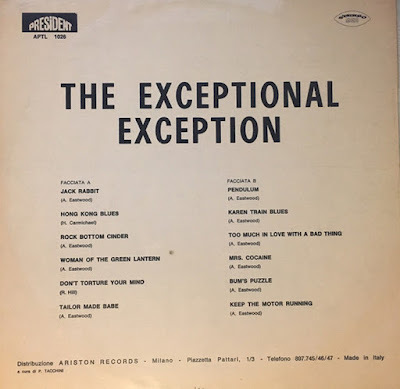 For whatever reason, The Exceptions' popularity in that country seemed to always exceed the support they had in the U.K. The Bad Roads ‎– Blue Girl (1966) 7"